SpaceX's first Falcon 9 rocket to launch from NASA's historic Launch Pad 39A soars into the sky to launch the tenth Dragon cargo mission for NASA from the agency's Kennedy Space Center in Cape Canaveral, Florida on Feb. 19, 2017. CAPE CANAVERAL, Fla. — SpaceX has launched the first private rocket from the same historic site that saw some of NASA's greatest space missions, then landed a booster nearby in a resounding success. 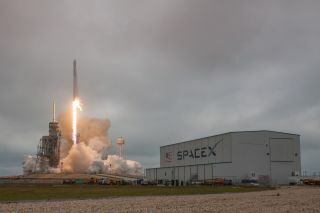 The California-based company's Falcon 9 rocket launched a robotic Dragon cargo capsule toward the International Space Station today (Feb. 19) at 9:39 a.m. EST (1439 GMT) from Launch Complex 39A at NASA's Kennedy Space Center — the same pad that once hosted Apollo moon missions and space shuttle launches. A launch attempt on Saturday was scrubbed just 13 seconds before liftoff out of caution, due to an unexpected reading from the rocket's second stage. Today's launch had action in the downward direction as well: The Falcon 9's first stage came back to Earth successfully, landing a few miles from the Florida launch site about 8 minutes after liftoff as planned. It was SpaceX's first daytime landing at the site, called Landing Zone 1, at the Cape Canaveral Air Force Station. "Baby came back," Space CEO Elon Musk wrote on Instagram after the successful landing. The Falcon 9's first and second stages separated about 2.5 minutes into today's launch. As the first stage flew back for its touchdown — a secondary mission objective — the second stage continued to power Dragon to orbit. The capsule got there safely and, about 11 minutes after liftoff, successfully deployed its solar arrays and began its two-day journey to the station. When Dragon arrives at the orbiting lab on Wednesday morning (Feb. 22), French astronaut Thomas Pesquet will grapple the spacecraft using the Canadarm2 robotic arm, assisted by NASA astronaut (and station commander) Shane Kimbrough. Both spaceflyers will be looking out from the station's cupola as they do this work. The first stage of a SpaceX Falcon 9 rocket approaches the company's Landing Zone 1 at Cape Canaveral Air Force Station in Florida after successfully launching a Dragon cargo mission for NASA from the historic Launch Pad 39A on Feb. 19, 2017. NASA astronaut Peggy Whitson will monitor the spacecraft's approach. Once Dragon is grabbed, ground control will take charge and mate the spacecraft to the station. Cargo missions always carry an assortment of supplies, tools and equipment for science experiments, but this one is particularly science-focused, NASA officials said. The research and hardware sent to the station represents the work of about 800 scientists around the world, NASA officials said — and the space station crew will get to work right away unloading and running those experiments. Dragon is packed with almost 5,500 lbs. (2,500 kg) of cargo in all, and will return to Earth after 29 days carrying nearly 5,000 lbs. (2,300 kg) back. Some space station additions are traveling in the unpressurized "trunk" of the spacecraft: SAGE-III, an Earth-monitoring tool that will look for ozone in the atmosphere, and a Space Test Program payload including the Lightning Imaging Sensor, which will track lightning worldwide, and Raven, which will collect data to help future spacecraft rendezvous autonomously. Starting on the second day after Dragon's arrival, those experiments will be removed and installed on the station using robotic arm attachments; the process could run for about 15 or 16 days straight, Hartman said. Three payloads no longer in use will head back down to Earth in Dragon's trunk. The science investigations riding in the pressurized part of the spacecraft — more than 1,600 lbs. (730 kg) of them — include tests of how "superbug" MRSA bacteria adapt in space, an antibody crystallization project, a stem-cell-growing experiment, a mouse study investigating how wounds heal in space and many projects designed by students. There are also several physical sciences investigations, including one that tests how metal alloys solidify in space, NASA officials said. "You can see that this particular SpaceX launch is going to keep our crew busy; it keeps us busy every day," Tara Ruttley, associate scientist for the ISS program, said during the Friday briefing. "We've never seen such a platform like this enabled on orbit for science." Kimbrough, Whitson and Pesquet — as well as their Russian cosmonaut crewmates, Oleg Novitskiy, Andrey Borisenko and Sergey Ryzhikov — will get some more robotic visitors soon. A Russian Progress cargo spacecraft is scheduled to launch to the station Feb. 22, and a Cygnus supply spacecraft built by Virginia-based aerospace company Orbital ATK will lift off March 19, if everything goes according to plan. Today's launch kicked off SpaceX's 10th cargo mission to the space station, which the company flies under a contract with NASA. Eight of the previous nine missions were successful; the failure came in June 2015, when a Falcon 9 broke apart less than three minutes after liftoff. This was SpaceX's second launch of 2017, and the second liftoff for the company since a Falcon 9 exploded on the pad during a routine pre-launch test on Sept. 1, 2016. That mishap destroyed the rocket and its payload, the $200 million Amos-6 satellite. SpaceX has now pulled off eight rocket landings — three of them at Landing Zone 1 and five on autonomous "drone ships" stationed in the ocean. These touchdowns are part of the company's effort to develop reusable rockets, a technology that SpaceX founder and CEO Elon Musk has said could revolutionize spaceflight. Launch Complex 39A hosted the launch of Apollo 11 in 1969, as well as most of the other crewed spaceflights in the Apollo program and many space shuttle flights. Before today, the pad's last launch was the final liftoff of the space shuttle program, which occurred in July 2011. SpaceX signed a 20-year lease for the pad in 2014. Editor's note: The Dragon spacecraft is scheduled to arrive at the space station on Feb. 22, not Feb. 21 as was previously stated.